To encourage the development of sustainable masonry structures through the application of socially, environmentally, and economically appropriate manufacturing, design, construction, use and maintenance practices, and disseminate knowledge regarding those practices. Documenting sustainable practices pertaining to masonry manufacturing, design, construction and reuse, and encourage their implementation. Reviewing sustainability policies and practices pertaining to masonry produced by other associations, including but not limited to the US Green Building Council. Establishing and maintaining US Green Building Council Liaison, including LEED task group input. Preparing a position paper describing “The Value of Masonry” regarding sustainable design. 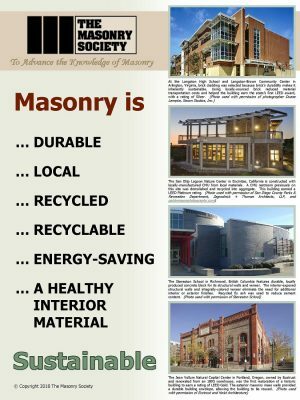 Compiling a bibliography of articles relevant to masonry and sustainability. Developing education programs for the TMS Annual Meeting and other forums.